This Dongbei restaurant was mentioned in the thread about Northern City, another regional restaurant, but as that post says, they should get their own thread. I had a couple of dishes here that were perfect for a cold night. I apologize if I butcher the names since I don't remember exactly and there were some communication issues- I tried to ask what things were, but could not always figure it out exactly. This was a nice opaque broth with slices of barely-cooked melon. I could not tell what type though. It was neither sweet nor bitter, but refreshing. The lamb in it was mostly bones, for the sake of flavoring the broth rather than as meat. The beef roll was a dim sum-like appetizer that was pleasing, if a bit unexciting. Nice meat wrapped in a roti-like bread. 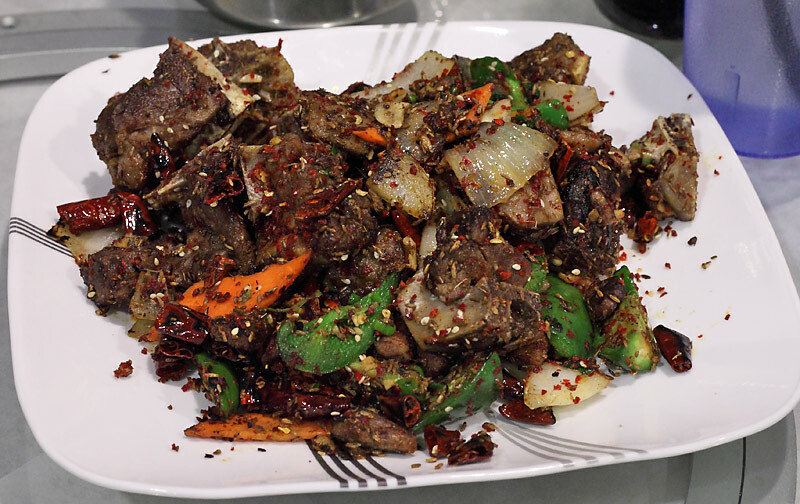 Cumin lamb was really what I was looking for when I came here- a hearty spicy lamb dish. Lots of black pepper, garlic, cumin, a dash of red peppers and what tasted like a bit of szechuan peppercorn maybe? I can't be sure, but it had a tingly kick of some kind. A chewy jelly handmade noodle dish that my dining companion was not crazy about, but I love glutinous things so I really liked it. It had a great briny oceanic flavor, especially with the bits of seaweed, and some vinegary notes. Can't wait to go back here. Food is very affordable and perfect for this weather. 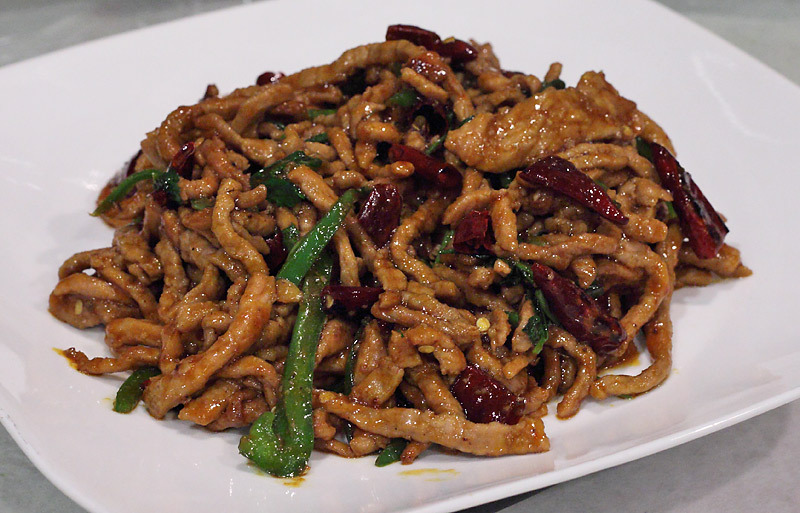 I am very excited that Chicago now has full restaurants for my two favorite types of Chinese food-- Hunan and Dongbei! I went with my wife and two friends on Tuesday to Home Style Taste.There's plenty of metered street parking. The dining room is on the smaller side and is mostly set up for groups of 4-6 with a few two-tops along one wall. One server had pretty good English, but overall be patient with the language barrier. Dongbei is notable for a few things in Chinese cuisine: cold salads, wheat breads and noodles, potatoes, hearty meat stews, and pickled vegetables. The menu has plenty in all those categories. I will definitely be back to try more. 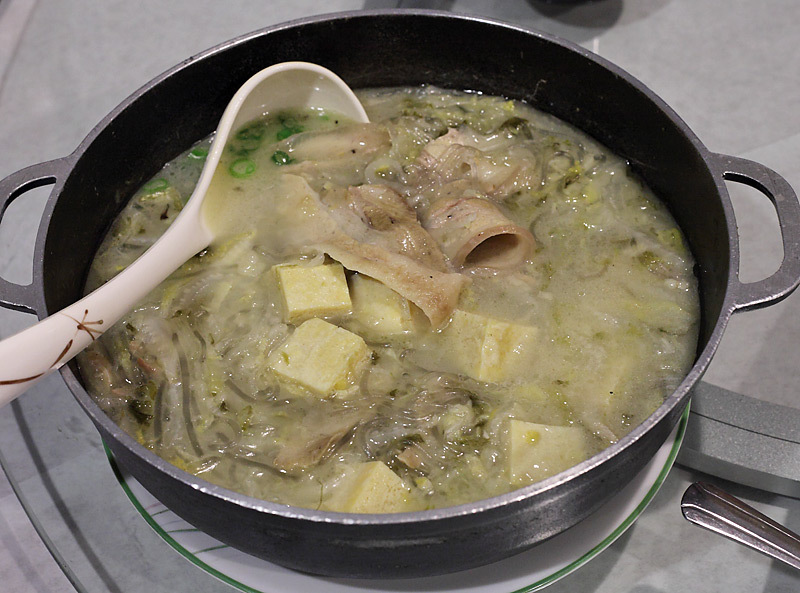 Jiachang Liangcai (家常凉菜) from the Cold Appetizer section. I forget how it was labeled in English, but literally translates to Homestyle Cold Vegetable. It is listed right under Colorful Wide Noodle (da la pi 大拉皮). It. Was. Excellent. So delicious. 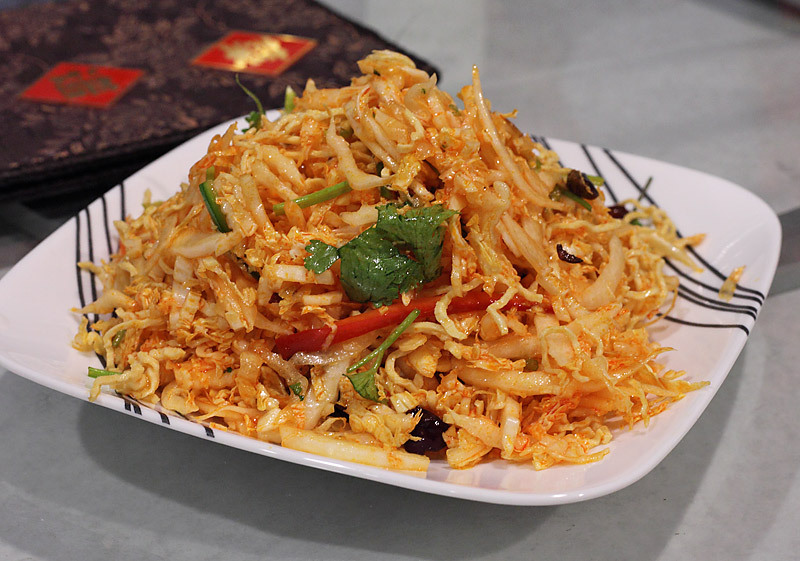 Thin strands of tofu noodle are tossed with chili, carrot, and cilantro stems, dressed in chili and sesame oil. Light, fresh, flavorful, a little spicy, with small bursts of cilantro freshness. Stir-Fried Cumin Flavored Lamb (my friend ordered this, I didn't check how it was labeled in Chinese) from the Stir Fried Beef and Lamb section. I never thought this was a northeast dish (had it in plenty of northwest restaurants) but it's delicious so I'm happy it's here. This version was good, juicy, fatty lamb slices crusted with whole cumin with just a bit of zing in the back from dried chilies. Hopefully the bone-in version has a little more flavor, because this dish just didn't pop for me. Very tasty and satisfying, but it could have been dry-fried a little crispier and come out with more heat and "wok breath". Scallion Pancake (tsong you bing 葱油饼) from the Dim Sum section. A very basic northern flat bread with green onions. I liked this better than ones I've had at Lao Beijing, but still not as amazing as a simple cong you bing can be. Very good, ask for a little vinegar for dipping if you like. Stir-fried potato, eggplant, and pepper (di san xian 地三鮮), which is a dongbei favorite, from the Stir Fried Vegetable section. It is handwritten onto the menu. Three hearty veggies, braised in tasty brown sauce. Again, very good but not excellent. 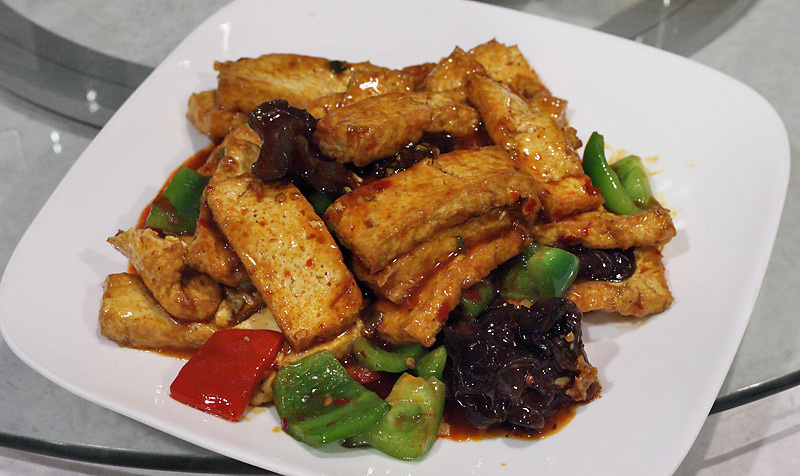 Homestyle tofu (jiachang doufu 家常豆腐) from the Stir Fried Vegetable section. It was just okay, the tofu was not fresh made, and was pre-fried (possibly even bought fried already). Heated through with brown sauce, garlic, and green pepper. My wife liked it, but I thought it could be much better. We also ordered some leafy green vegetables (listed on a separate Daily Specials insert). They were fine. Extremely reasonably priced-- $70 after tax and tip for more than 4 people could eat. Many other things look excellent and I would definitely go back for: Homemade Cabbage and Tofu salad, Spinach with Peanut and Vinegar, Smoked Rabbit, Pork with Dry Tofu and Jalapeno, Sliced Potato with Vinegar, and all the dumplings, skewers, and soups. Yum. The soup in the top picture appears to be Winter Melon soup. Winter Melon is also used as a filing in some Chinese bakery goods and is used in some candies. I'm lucky in that my wife makes Winter Melon soup from time to time. Here are some photos from a meal at Home Style Taste back in November that I didn't get around to posting. They have a long menu that's fun to explore, especially if you're willing to take chances on some barely-explained dishes. Meals start with a gratis pile of crunchy, chile-marinated shredded cabbage. A great balance of sour, sweet and hot. 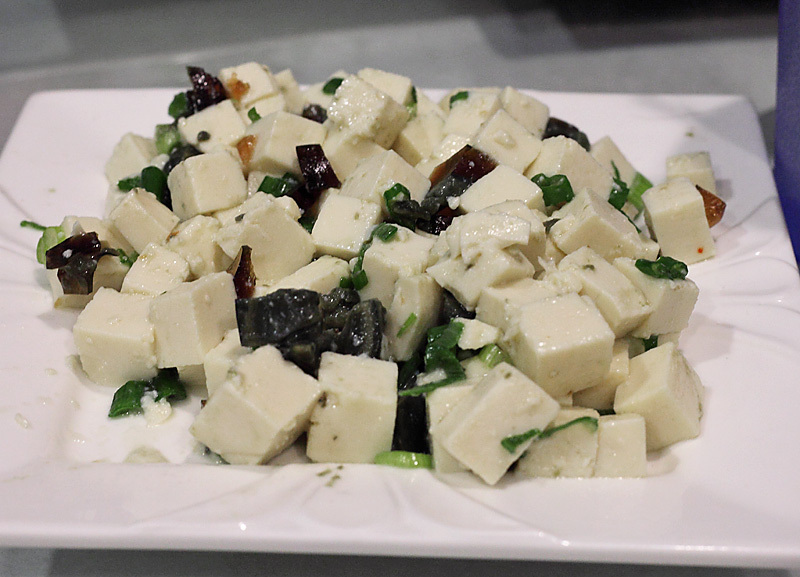 Tofu with preserved egg also showed off the kitchen's fine ability to balance strong flavors. High on my list to re-order. Smoked meats (done in house, I think) were slightly disappointing but still worth splitting among a large group. Pig heart was somewhat dry and uninteresting while pig tripe had more going on texturally than gustatorially. We probably should've opted for the "smoked pig internal combination" instead. Most of the tables (all Chinese-occupied) held a pot of "stewed mushroom with chicken" so we went along. 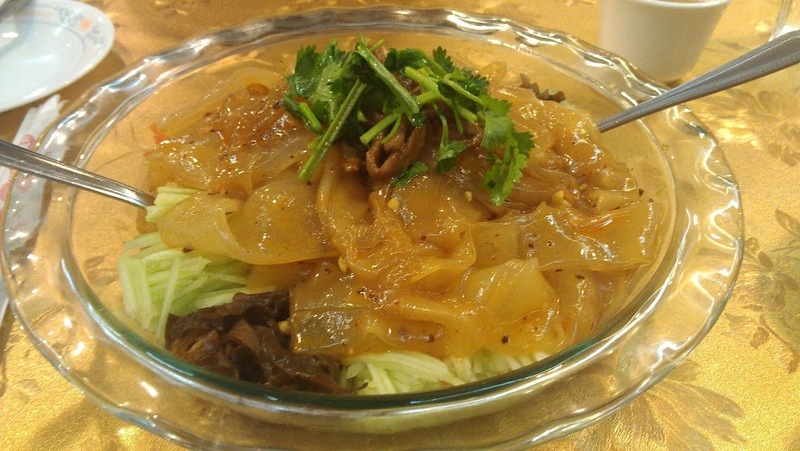 A typical Dongbei dish of chicken pieces, dried mushrooms and mung bean noodles in an aromatic brown gravy—rich, stick-to-your-ribs food. Speaking of bones, watch out for the countless shards left after the bird is whacked into random serving pieces. That's a corn cake on top, great for soaking up the juices. Lamb with radish and black fungus is another typical Northeastern stew, with deep, dark, satisfying flavors. I enjoyed an astonishingly good meal at Homestyle Taste last night. The owners were super welcoming and were excited to offer recommendations. Nearly every dish was a highlight and I'm excited to return. I was most impressed by how many unique combinations of textures and flavors the cuisine offers. I haven't had much Northeastern Chinese food in the past, but it's a cuisine I'm enthusiastic to learn more about after this meal. Tofu with preserved egg - They use a flavorful, soft tofu that matched really well with the salty, preserved egg (and plenty of scallions and sesame oil). It's one of those dishes where you've enjoyed the ingredients separately before, but never realized how good they could taste together. It was one of the more surprising items just because it was so simple yet so delicious. Smoked pork roll - I wasn't sure what to expect when we ordered this, but the result was a homerun. It was essentially a scallion pancake sandwich stuffed with unctuous smoked pork and a sweet and umami sauce. I'm surprised more places don't offer this scallion pancake variation since it really worked. 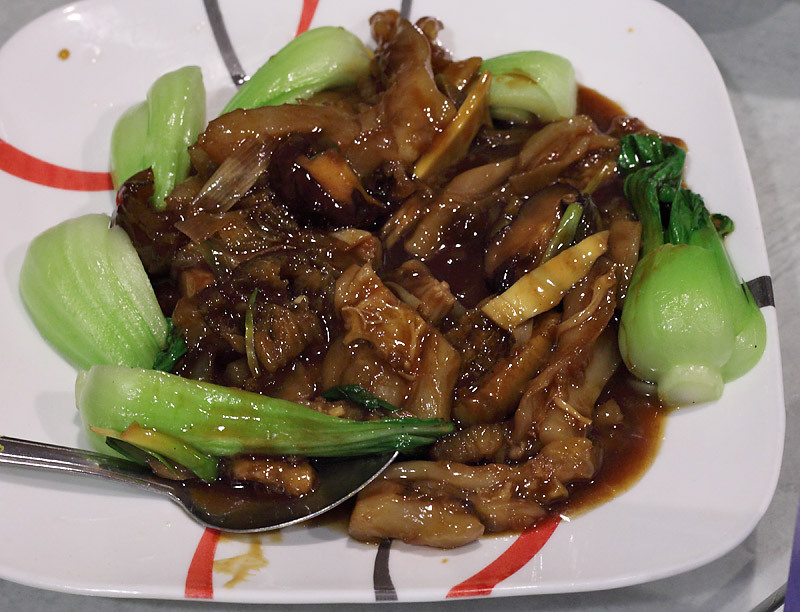 Braised tendons with sea cucumber - This one was possibly the biggest hit of the night. This combination of flavors and textures was really exceptional. The sea cucumber brought some seafood funk and a little crunch to balance with the super soft and gooey tendon. The shiitake mushrooms had an intense umami flavor and everything was served on top of steamed bok choy that provided a crunchy platform for all the flavors to mingle. The tendon took on all the flavors and each bite featured a different combination of textures. This dish really illustrates the attention to balancing textures and tastes that makes Chinese cuisine so delicious. Cumin flavor lamb with bone - You can smell the cumin when you walk into the restaurant. The lamb is quite gamey yet soft with lots of fatty pieces and some tendon still connected to the bone, so I can see how this rendition wouldn't be for everyone. But I love full-flavored lamb, and really this dish needs some gaminess to offset the robust spiciness. It's something I order frequently at Chinese restaurants, and this version really stood out as the most aggressively flavored of the bunch. I loved it. Flavored spicy hand tear beef jerk - It's kind of hard to make out from the name of the dish, but it's dried shredded beef (like beef jerky) that is breaded and fried till crispy with lots of chili peppers and garlic. The dried beef is intensely flavorful and it crackles as you eat it. 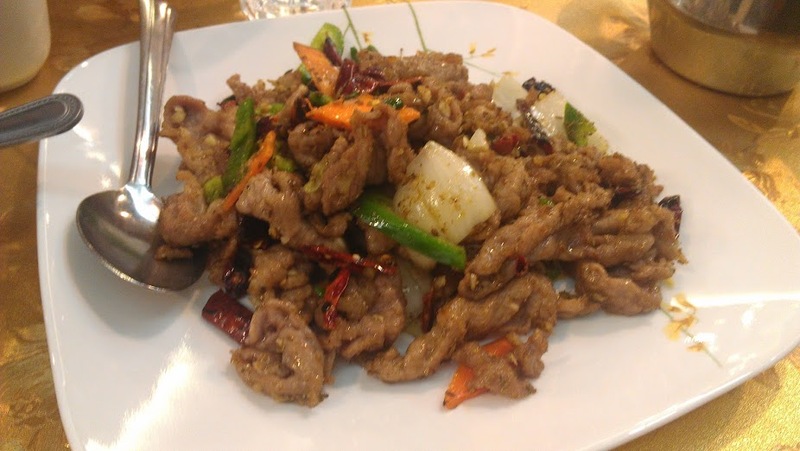 It's similar to the twice-cooked duck at Lao Hunan in that the rich flavor of the meat is amplified by its crispiness and accented with aggressive spicing. I'm not sure I could eat a whole plate of it because each bite is so intense, but as a supplement to a meal with some steamed greens and hearty stews, it sticks out like a firecracker. The menu is full of interesting sounding dishes with lots of offal and unique stews. This is definitely a cold-weather cuisine. 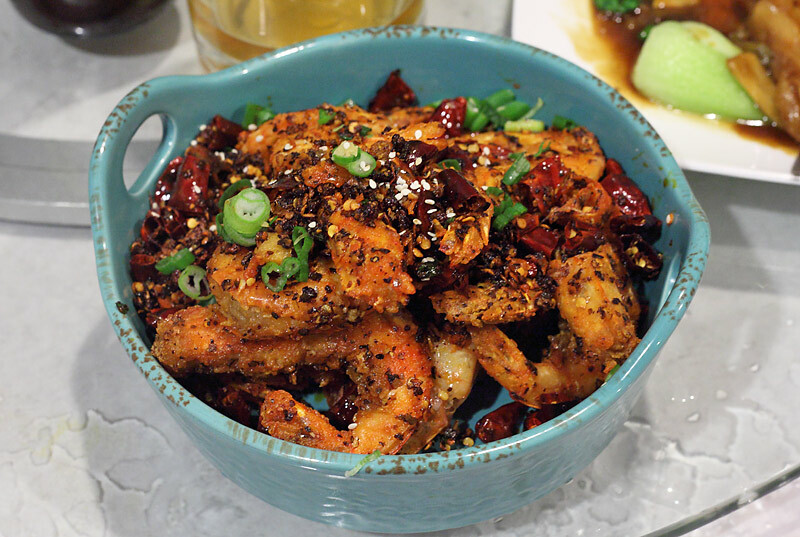 It's a welcome addition to the ever-expanding regional Chinese cuisine landscape in Chicago. As a lover of big and funky flavors, this was right my alley. I was lucky enough to have been one of Turkob’s dining companions the other night. I have to agree with him, the meal was very impressive. Don’t get me wrong, I am a huge fan of Ed’s and Northern City, but if this single meal is any indicator, i can easily see Homestyle Taste becoming my new go-to for Dongbei cuisine. As for the Dongbei favorites, I agree with most that the cumin lamb is a must order (seriously, bone in!!). At Homestyle T. this was a step above the others, even if just by a small margin. I found the meat to be cooked to be tenderer as well as the cartilage still attached to the bone, very edible. At the other 2 places, the lamb was always just as flavorful, but sometimes a bit chewy. Also at Homestyle Taste, the capsaicin spice was a little higher, though quite balanced with the other spices. I’ve also had the smoked pork with hoisin and scallions pancakes at Northern City. The assembly was identical, but at Homestyle the pancake may have been a bit thinner and crisper, leaving the insides to be more substantial. Turkob's details on the other dishes were spot on, it's a very exciting menu with quite a few things I didn't notice at the other places. At moments during the meal I had to just stop and appreciate the detail to quality. 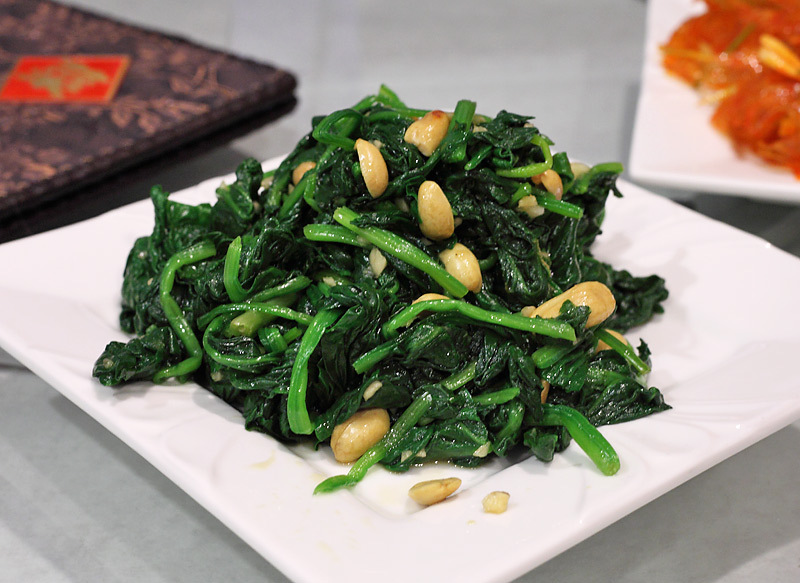 For example simple things like the stir fried peapod greens which were crisp and fresh, and subtly seasoned to add a nice fresh counterpart to the meal. Turkob touched upon the service a bit, but I have to give huge props to the staff at Homestyle Taste. The place appears to be run by an extremely cheerful and loving family. The proprietor (mom?) had a huge grin plastered across her face the entire time we were there, almost to an absurd level. The atmosphere was very laid back, the staff in sweat pants, everybody seemed as if they were doing what they love to do. Despite the laid back atmosphere service was attentive, plate changes being offered 3 times, each time a tag team of staff placing the new plate as soon as the previous one was removed. Different staff members checked with us throughout the meal to make sure we were enjoying the taste of everything. We were the only non-asian table in the place, but we were treated like family. I could go on about the service but I think I’ve said enough. Great place! I can’t wait to return. Went to Homestyle Taste a few weeks ago and thought it was very good. Had the Stewed Pork with Sour Cabbage and the Stir Fried Pork with Brown Sauce (actually Zhouzi). This Friday, we went to New China Town (Dongbei Mala) on 207 W Cermak. They recently changed ownership and their new owners are Northeasterners. They now have a northeastern menu in the front part of the menu (while still serving the old chop suey for their old customers). We had the Green Peppers with Dried Tofu, which was really good. The Dried Pork with Garlic Sprouts ended up using leak instead, but otherwise it was very tasty as well. We also really liked their dumplings, which they make in house. Would definitely recommend trying the place if you're into northeastern Chinese food. OneMan wrote: Long time lurker, first time poster. Welcome, and thanks for the reports! Green peppers with dried tofu is calling to me - will have to check out New Chinatown / Dongbei again soon. Really enjoyed my first trip to Homestyle Taste with a group of 6 -- a nice size for exploring the menu. We tried a couple of dishes that haven't been mentioned yet. One of my favorites of those (and of the entire meal) was a pork with sour cabbage soup--it arrived looking like mystery parts--not necessarily a problem but we were a little tentative in digging into the milky broth with spongy, stomach-lining-looking pieces floating amongst strips of shredded greens. And, of course, when we were ordering the staff tried hard to dissuade us saying we wouldn't like it. We shouldn't have worried. It was terrific! The spongy pieces were actually "frozen" tofu which floated on the top. Beneath the tofu were gorgeous wide slices of bacon and the greens, which were, essentially, sauerkraut. Flecks of cumin and caraway completed the dish. This was one hell of a Polish-Chinese mash-up!! My other favorite dish not previously mentioned was one we ordered after we'd received all of our other food--a cold dish of spinach in a bracing vinegar sauce with peanuts. Wow. My kind of dessert. Other dishes ordered were the bone-in lamb with cumin; the eggplant/potato/peppers in brown sauce, the tendons with mushrooms and the pea tips. Our PP total, including tax and tip was under $18 each. Incredible. Can't wait to return. turkob wrote: Flavored spicy hand tear beef jerk - It's kind of hard to make out from the name of the dish, but it's dried shredded beef (like beef jerky) that is breaded and fried till crispy with lots of chili peppers and garlic. The dried beef is intensely flavorful and it crackles as you eat it. 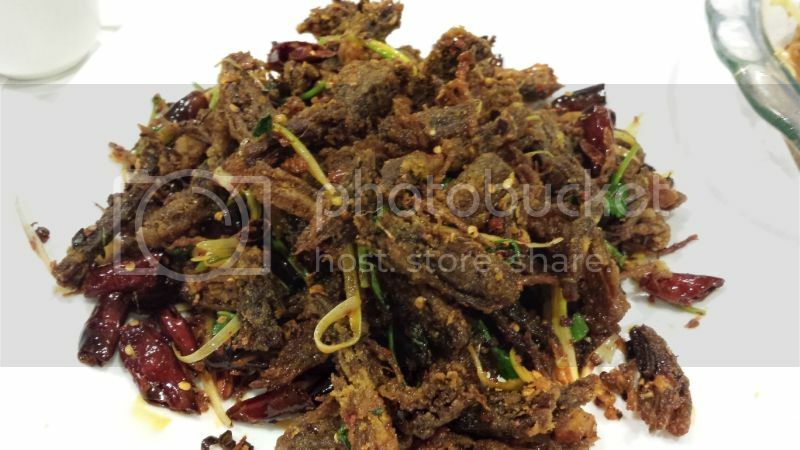 It's similar to the twice-cooked duck at Lao Hunan in that the rich flavor of the meat is amplified by its crispiness and accented with aggressive spicing. I'm not sure I could eat a whole plate of it because each bite is so intense, but as a supplement to a meal with some steamed greens and hearty stews, it sticks out like a firecracker. This dish deserves to be up there on the Chinatown first team all-stars, with crack chili chicken leading the point. Aggressively spiced indeed, the taste of the meat without the peppers reminded me of the burnt ends of brisket or pulled pork, but with the big difference being the meat's tenderness because it's deep-fried. Yeah, you probably shouldn't be eating a whole plate of it, but you might end up doing so anyway- my family and I were returning to and picking through to find any nuggets of meat left. boudreaulicious wrote: Beneath the tofu were gorgeous wide slices of bacon and the greens, which were, essentially, sauerkraut. Flecks of cumin and caraway completed the dish. You can find quite a bit of sour cabbage on the menu- we were told it's quite typical for northern Chinese. The taste in the stew at times was indeed almost sauerkraut like- made me wonder if a Polish or Russian guy trekked to northern China one day. The sour cabbage is more understated in the dumplings, which were also great. Finally, a shoutout to the waitstaff/ownership, who were fantastic to us throughout the meal, recommending to us dishes very typical of the region. It feels like the Bridgeport Chinese restaurants are more hospitable than the ones in Chinatown- partially because they don't have to worry about as much turnover, but probably also due to the fact that they need to work a bit harder to ensure returning customers. From what I've read, it was the Mongol invasion that introduced the idea of fermenting cabbage to Europe. I've had several outstanding meals at Homestyle Taste. The hot pot (we chose fish) was a real standout. Be sure to get the fried dough as one of the ingredients. After another outstanding meal tonight, I just wanted to bump this thread up and encourage more people to try out homestyle taste. After several meals, it continues to shine just as bright as it always has. I wake up at night craving the bone in lamb with cumin (best in town! ), and the "spicy hand tear beef jerk". We tried the cold tendon appetizer, and I wish I had a camera with me, as it was a thing of beauty, as well as tasting better than any version I've had. A few other points of interest... The appetizers are so much larger than at many other similar places, in some cases 3x to 4x larger than you would expect from, say, of the Lao restaurants. 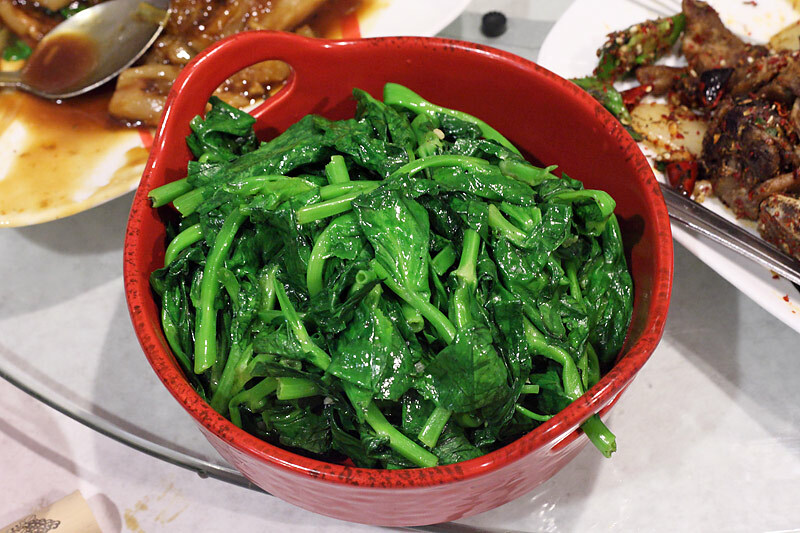 I was happy to see many options on the menu for chinese greens: water spinach, bok choi, and peapod leaves. They FINALLY started translating the chinese specials, which were previously only posted on the wall. Now a specials menu arrives at the table with the regular menu. There were a lot of interesting things on there, but it was too hard to stray from our favorites. And as usual the service was warm and attentive. They were very pleased that we enjoyed some of the authentic northern dishes, and eager to tell us about their homeland. Considering there are rave reviews on this thread, and no negative, it leaves me wondering why so few people are posting on it. Has anyone eaten here and had a bad experience, or is it just too far south for people to travel? I was with laikom and have to agree it was another outstanding dinner at Homestyle Taste. In addition to the dishes I talked about in my earlier post, another highlight from last night was the spinach with peanut and black vinegar. Once again, the dish managed to combine relatively simple ingredients in a way I've never experienced before. The result is greater than the sum of its parts. The dish makes so much sense after you try it, I was left wondering how I'd never had that combination of flavors before. I was with laikom, turkob and Teresa at homestyle taste too. As the lone Asian in the group, I'd like to think I brought somewhat of a legitimacy to the group. But then I go and order something that borders on boring americhinese. I ordered the shredded pork with bamboo. It wasn't the fermented bamboo you see at aroy, but a delightful fresh crunchy version with strips of pork. I didn't care for the green peppers, but it didn't bother me so much because the sauce (not heavy or gravy like) was delicious. Meat was tender and as we saw with the spinach and vinegar and the preserved egg tofu dishes, these simple ingredients were amazingly balanced. Before we left, we picked the brain of one of the waitresses on most popular dishes we missed, and she gushed about all the great options -one with eggplant and potato piqued my interest. I'm looking forward to my next trip to Homestyle Taste. tofu w/preserved egg - this was so well balanced and i'll have a hard time not ordering it again. Preserved egg, tofu, and green onion ever so lightly dressed. Perfect. tendon - thinly shaved and lightly slicked in chili oil. Going back and forth between this and the tofu was a great contrast in textures and a perfect way to start a meal. bone-in lamb w/cumin - I think some thought this was a little light on lamb flavor but it's all about that smoky cumin assualt. My pieces were all nicely done with no excessively chewing bits which sometimes turn up in lamb w/cumin preps. lamb soup - IMO almost similar to sul lung tang, if the lamb w/ cumin didn't bring the lamb this sure as hell did. spicy hand tear beef jerk - beer drinking food...crunchy and loaded w/chilis. I'm sure others will fill in some of the gaps in my report. AlekH wrote: I'm sure others will fill in some of the gaps in my report. I enjoyed the meal. A few dishes really stood out for me, like the cold tendon dish (Red Chilli Beef Tendon), the spicy cabbage and the soup. It's a large menu so naturally there were some hits and misses, especially since we were exploring. The hot tendon dish (Tendon with Sea Cucumber) was too sweet for me and the shrimp dish at the end was just not good, though, with better quality shrimp, it might have been. But overall, I liked a great majority of the dishes we had. Here's what we ordered, in the order of Ronnie's pictures. turkob wrote: Here's what we ordered, in the order of Ronnie's pictures. Thanks, Onur. I added the names of the dishes to my post. I'd like to nominate this for "Sandwich I most want to eat this year"
If you're a fan of Jade Tofu at Lao Hunan, the flavors of the red chili beef tendon were remarkably similar and this was probably my favorite dish of the night. Though I'm often not a fan of beef tendon (generally when it's cut too thick and it's too chewy), this was perfect and so thinly sliced. The tendon dish was served about the same time as the funky preserved egg with tofu and I not only loved this dish, but I found the flavors to be so different from the tendon dish that they actually played very nicely off each other. There may not have been anything particularly special about the shredded pork with special chili sauce, but it was absolutely delicious and just so comforting. This is the type of dish you dream about on a cold, snowy Chicago night. The star of the iron pot lamb with winter melon was unquestionably the intensely rich lamb flavor. I just couldn't get enough of it. My lone complaint is that I found the winter melon slices too thick, large and chewy. I would have preferred some thick, hand-pulled noodles. But don't get me wrong - the lamb flavor was so fantastic I would absolutely get this again. And what was not to like about the smoked pork roll. 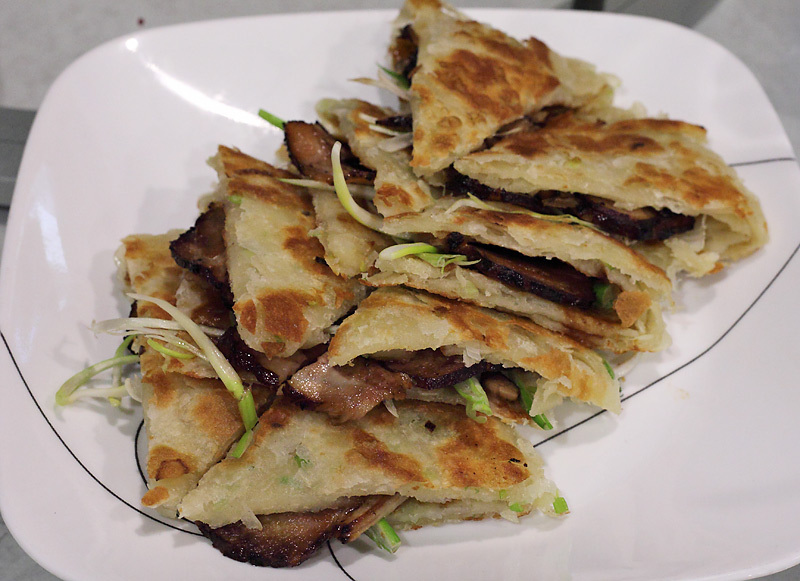 Essentially, a slightly crisp, scallion pancake with smoked pork - delicious. The beef jerky was delicious too. There were a couple of dishes I thought were fine, could have been excellent, but missed the mark for some reason. In this category, I place the spinach with peanut and vinegar (like the flavor a lot, but didn't like the really overcooked spinach) and the cumin lamb (I found the lamb to be dried out so there was little in the way of lamb flavor, but I liked the spicy, smoky cumin part). Then there were some dishes I'd avoid ordering the next time: the dumplings (not really remarkable in my opinion) and the fried shrimp with red chili sauce . . . good sauce and all, but the shrimp were truly awful. Overall, a very nice meal and a place where I will absolutely return, particularly on a cold night - this food was built for a tough, Chicago winter. I was going to post on the GNR nom. thread but, ahem, excuse my ignorance, how can I speak towards the merits of a place I have only eaten at once? I did have the pleasure of joining the turkob-organized meal a month or so back. I've held back on posting, since I have a few questionably-educated suppositions. Keep in mind that I know very little about Dongbei cuisine, making my quibbles here all the more dubious. From my finite knowledge of the cuisine, via dilettantish Googling but also through input from a few of my friends with Dongbei ancestry, there are a few tenants of their cooking style: a reliance on wheat based noodles, dumplings, and pancakes; hearty meat-and-potatoes based stews and a prevalence of lamb; and a pronounced incorporation of vinegar and pickled vegetables. And yes we saw excellent applications of these ingredients in this meal: the tart cold spinach appetizer, the awesomely comforting Iron Pork Pot with Pickled Cabbage, and the flakier and more nuanced-than-Ed's Smoked Pork Roll (my three favorite dishes of the night, fwiw). I didn't love some of the other stuff though, even the Spicy Hand Tear Beef Jerky (which a few of my Chinese friends love too, so who the f*ck am I to judge, taste is subjective, of course). Generally, I find dry chili preps to be unsubtle, low hanging fruit– deep fry anything and stir fry it with chile oil and its bound to taste good, yeah? I have never understood the appeal of certain sacred cows that fall into the "crack" genre, kinda junk food, methinks. Some of the fried spicy stuff, like the shrimp, for instance, were not good at all at HT. Where am I going with this? In my one visit, I liked this restaurant and am not disapproving of its GNR nomination. Its a cozy, affordable, and welcoming place with at least a few sensational dishes. I think it would behoove me to dig deeper into their menu. Where are the cold noodle dishes? I see they have a "Korean Cold Noodle with Spicy Soup and Kimchee" on the menu, has anyone tried that? What about the "Colorful Cold Wide Noodle" that I've read about somewhere? And what about the fabled Zha Jiang Mian, do they dish that up at Homestyle Taste? No mention, either, of my Chinese friends favorite thing to order here, their lamb skewers. My guess is that there is a lot more digging to be done to find more of their truly remarkable dishes. Let's go! Jefe wrote: ...Chinese friends favorite thing to order here, their lamb skewers. My guess is that there is a lot more digging to be done to find more of their truly remarkable dishes. Let's go! I have had the skewers and the lamb was by far the best of the bunch, definitely worth ordering. It was a while ago, but I think I recall the others not being quite as good, the chicken being breast meat or otherwise pretty dry, and the squid coming out tough. Had another great dinner at Homestyle Taste last night. Got to try a couple new dishes and snapped a pic of the famed spicy hand beef jerk. This is the colorful wide noodle. I'd had it at Ed's a couple times, but never ordered it at Homestyle till last night. 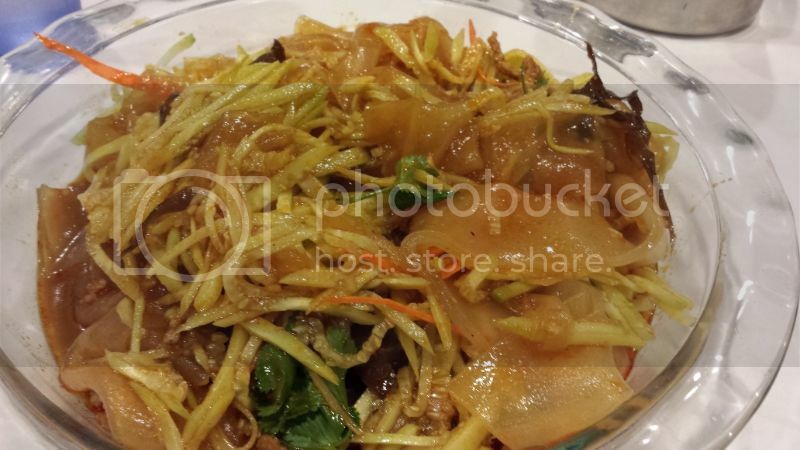 It comes out with a layer of springy mung bean noodles on top of a salad of cucumbers, mushrooms, and cabbage that are cut into matchsticks. It's served cold and tossed at the table. 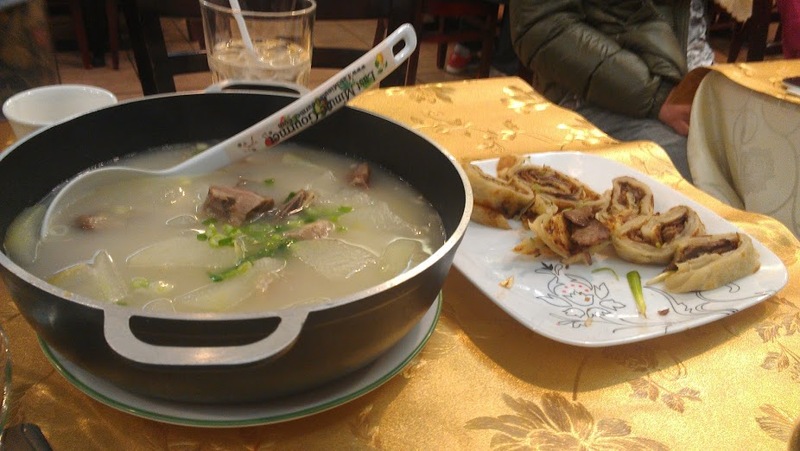 This dish really illustrates the culinary connection between Dongbei and Korea. The sauce is a mix of vinegar and mustard that mingles with the crunchy vegetables in a way that reminded me of banchan. On this particular night we requested that they restrain the heat for the sake of our dining companions, and I think this dish suffered a little for it. The textural contrasts were fantastic and the flavor was pleasant but it lacked the punch that would've made the dish pop. Next time I'll ask for them to amp this one up. The table loved it though. 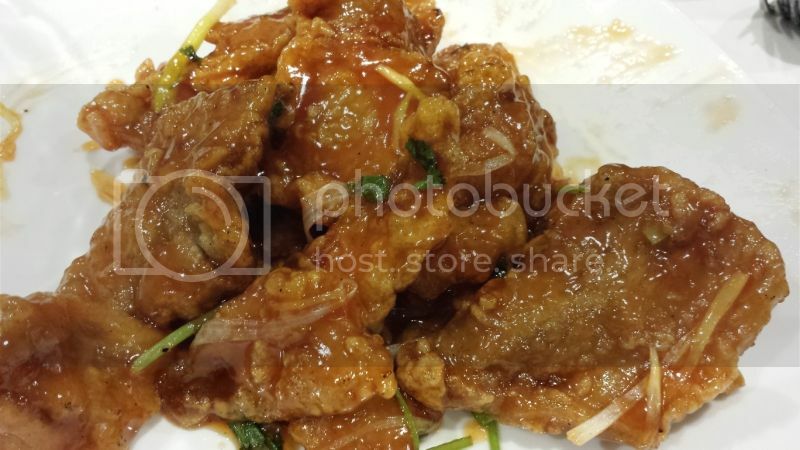 We also ordered the sweet and sour pork. This is an exemplary rendition balancing sweet and sour exactly as I'd like it. The pork has enough chewiness to stand up to the crispy exterior. We've had sweet and sour pork at many Northern Chinese joints around town in the past year (Northern City, Ed's, Lao Beijing, etc) and this was our favorite of the bunch. And of course, the star of the show was the spicy hand tear beef jerk. For those who've ordered this before, you can see that the quantity of chilis on the plate is less that usual. The dish was still plenty spicy and wowed the table. It's the kind of thing that people slowly pick at for 30 minutes after you're "done eating" because a small bite packs so much flavor. Interestingly, probably because of the reduced chili heat, the ma la in the dish was more noticeable than on previous trips. I prefer it with a little more heat, but it was still great last night. While some dishes have been my go to's, a couple new ones made it into my dinner last pm. The stewed mushrooms w/chix and noodles were very good, an umami bomb (gonna name my next band that: umami bomb) with the noodles and shrooms the stars of the show in this dish. Chicken was a bit dry, but the other ingrds made up for it. Also, for my crab rangoon loving friends, I ordered the sweet and sour pork and was plesantly surprised. Was expecting glop, which it wasn't, and was quite nice in a safe kind of way. The lamb w/cumin, the spicy hand tear beef, the tofu w/preserved egg, the smoked pork roll, homemade style tofu were all standouts both in flavor and texture. I really enjoy this place, more so than Ed's or Northern City. Dinner for 6 w/way too much ordered came to $23 pp including tip. I'm coming around to Homestyle Taste, I just have to settle into an ordering pattern that suits my tastes. That said, I really enjoyed a lunch here today. I followed the advice of my friends that I mentioned above + ordered my two favorite dishes from our big dinner here in January. Colorful Wide Noodles were a study in textures: slippery, chewy, and crunchy all at once. Every table in the house seemed to order this dish. I loved its refreshing effect to offset the richer dishes we ordered and dug that horseradish-y hum. 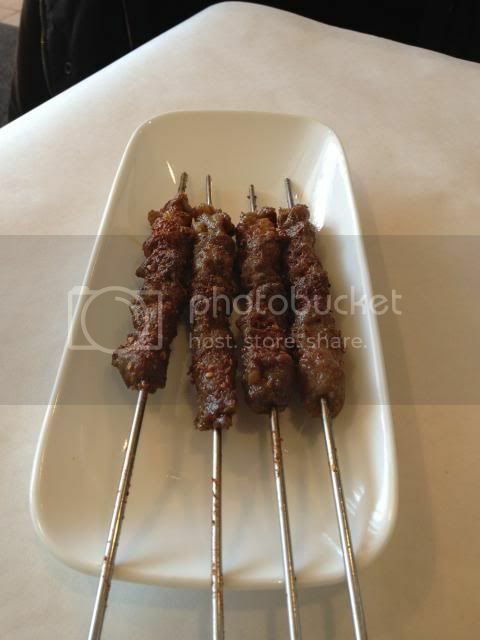 The Lamb Skewers were addictive morsels with an ideal meat-to-fat ratio. A very similar flavor profile to the lamb with cumin with, you betcha, lots of cumin and chili. They were served piping hot and had a cleaner grilled taste than the lamb with cumin. These will be an essential order in the future. Iron Pot with Stewed Pork and Sour Cabbage hit the spot, rich but also kind of refreshing at the same time. This reminds me of a mellower and meatier version of my favorite Sole Fish Soup with Sour Pickle soup at LSC. The Smoked Pork Roll, on second try, is my favorite version of this dish. I've only been twice now, but will certainly crave the above dishes and can't wait to return for the stewed mushroom & chicken dish Jazzfood mentions above, stir fried potato dishes, and Cold Korean Noodles. Also, could what their menu lists as "Noodle with Fried Soybean Paste" be Zha Jiang Mian? Worth noting, my dining companion today is a sufferer of GERD and has a restricted diet of no alliums, tomatoes, citrus, chiles, peppercorn, etc. With the exception of the skewers and our order of scallion-free Smoked Pork Roll, he found this to be a great cuisine for his affliction, full of flavors and textures and most importantly, seasonings that he relies on to keep things interesting- ginger, vinegar, mustard, horseradish and pickled stuff. He only had to work around a few scallion garnishes and braved the relatively lightly chile-oiled noodles. I got the chix dish idea from Rene G's post. Hello. Had dinner with some friends at Homestyle Taste last night. We ordered lamb skewers, tofu with cabbage salad, mushroom and chicken in iron pot, beef roll, pea shoots, and fish (can't remember what kind) in black bean sauce. Simply delicious. I must say i was really impressed with the tofu and cabbage salad. The tofu was cut very thin and looked a lot like ramen noodles. The balance of sweet and sour was perfect. That coupled with the lamb skewers would make a great lunch on its own. I cannot wait to get back and explore more of the menu. We had dinner this evening at Homestyle taste. The cumin lamb was wonderful as described above with multiple layers of flavor. 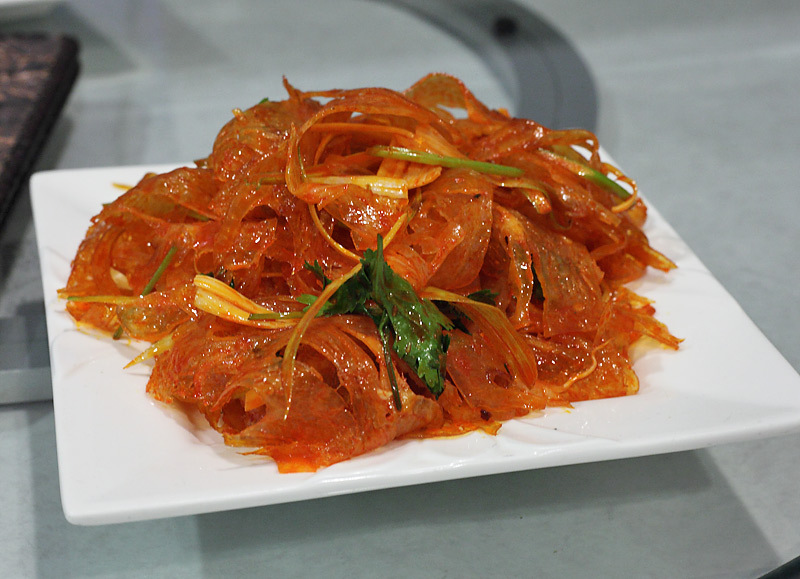 We had a shaved bean appetizer which resembled noodles and had a spicy, clean flavor. Off the handwritten menu we had pork and celery dumplings and fish filet with corn. The strong Chinese celery taste came through on the dumplings very nicely. The fish filet with corn, however, was a disappointment. We were surprised to find that this dish was essentially a big bowl containing about a pound of warmed frozen corn with a very few thimble sized nuggets of fish. The corn did not have any noticeable seasoning. It seemed odd. Mrs Willie & I showed up at Homestyle about 7:30pm yesterday Saturday night. Place was packed. The waitstaff offered to have us join other tables of guests where there were seats or walk around to the back of the restaurant where there are two 8 person tables in a different room, again with guests. Not sure why but we chose the latter. Rene G wrote: Meals start with a gratis pile of crunchy, chile-marinated shredded cabbage. A great balance of sour, sweet and hot. maybe because they were so busy last night but sadly we did not receive the marinated cabbage, I forgot to ask for it. Didn't try anything new per this thread, just reporting that the smoked pork roll, cumin lamb, and hand tear beef were all stellar. We were very happy to finally get to this restaurant.